DIN 18534-1:2015 is a draft German Standard addressing waterproofing for indoor applications. DIN 18534 Part 1 deals with the requirements and principles for design and execution. DIN 18534 Part 1.8 addresses planning and construction principals. DIN 18534 Part 1.8.3 deals with connections. 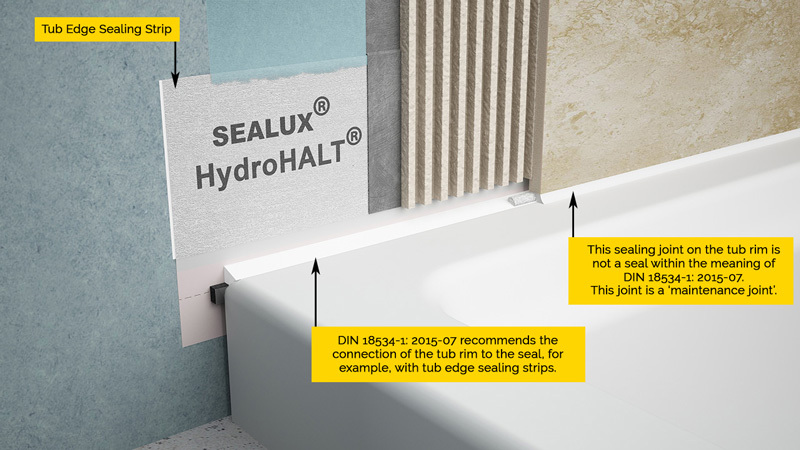 DIN 18534 Part 1.8.3.2 specifically addresses the sealing of areas under / behind bath or shower trays. carry out the waterproofing underneath and behind the trough if necessary with underfloor drainage. Sealing joints on the tub rim are not a seal within the meaning of this standard.